Living Pavilion, Behin Ha's winning entry to the design/build architectural pavilion competition for the 2010 summer season on Governors Island, is a low-tech, low-impact installation that employs milk crates as the framework for growing a planted surface. The City of Dreams competition asked New Yorkers to re-imagine the future of their city, to consider what's possible in a sustainable yet urban metropolis. With Living Pavilion, Behin Ha explores what it means for nature to be injected into a dense, active city, not replacing its vitality, but adding some green to the mix. Experimenting with unconventional planting techniques, Behin Ha's scheme embraces a synthetic union of nature and infrastructure, with the belief that such a union is not only environmentally performatitive (for example by providing cooling through evapotranspiration), but also adds a new dimension to the urban experience, making possible new forms of spatial and architectural expression. SITE STRATEGY: Visitors to Governors Island arrive by Ferry on the North Side of the Island, and approach FIGMENT via Colonel's Row and the vaulted opening through Liggett Hall. Living Pavilion abuts the strong axis created on the site by the Liggett Hall passageway and terminated by the monuments on the North and South sides. 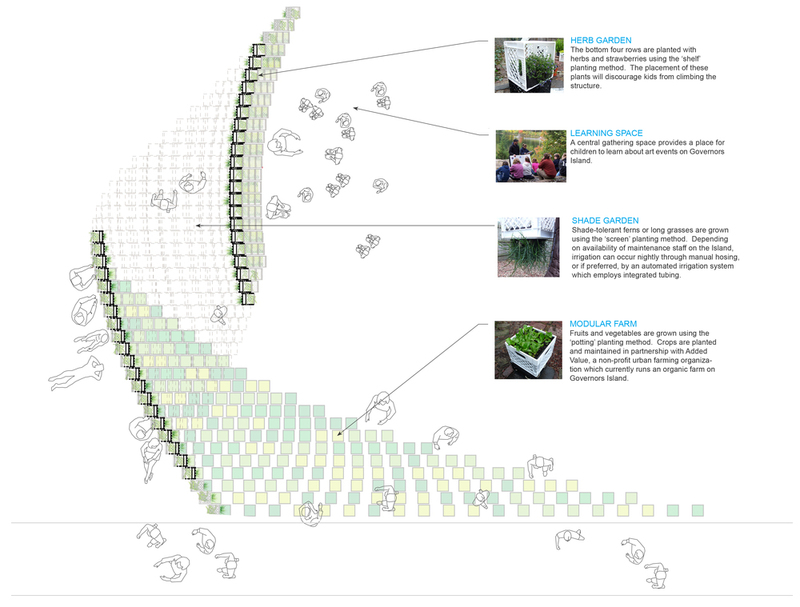 PLANTING ANALYSIS: Living Pavilion aspires to create a synthesis of form, structure, light, and life. The shape and orientation of the pavilion creates varying amounts of solar exposure at different parts of the surface. Structural considerations suggest an optimal distribution of the light-weight growth medium, resulting in minimal stresses. The combination of these factors provides a template of diverse conditions for planting. The surface underneath the vault is planted with hanging shade-tolerant plants that require little soil, while the flat extension of the pavilion onto the ground surface allows for deep-root plants needing direct sun. ENVIRONMENTAL BENEFITS: The planted surface of Living Pavilion provides a moderated temperature through a combination of shading and evapotranspiration. Much like perspiration in people, plants evaporate water through their leaves. This process of evaporation helps to moderate the temperature beneath the canopy formed by the pavilion. Assembly & Materials: The pavilion's construction is simple and modular, relying on common materials for its assembly. Distribution: At the end of the season, the pavilion’s modular design allows easy disassembly and distribution of the planted milk crates to the New York area for use in homes, public places, and community gardens.